NASA Mars Reconnaissance Orbiter’s HiRISE image of recurring slope lineae (RSL) in Melas Chasma, Valles Marineris. Arrows point out tops and bottoms of a few lineae. The dark, fingerlike features that creep down steep Martian slopes in warm weather continue to puzzle scientists. These "recurring slope lineae" (RSL), which have been spotted by NASA's Mars Reconnaissance Orbiter (MRO) at low and middle latitudes on the Red Planet, fade during cooler months but come back again annually at nearly the same locations over multiple Martian years. More than 200 researchers and engineers participated in that meeting, sifting through data and imagery in an effort to narrow down potential landing sites for NASA’s next Mars rover, which is scheduled to launch in 2020. Evidence is mounting that RSL are the mark of some kind of volatile substance, and a leading theory posits that they are caused by the flow of salt-laden liquid water. If so, could RSL be the best markers of available water to help sustain future crewed Mars expeditions? RSL sites may also offer insights into subsurface Mars, as well as help identify places where microbial life could occur on the Red Planet, some scientists say. For example, researcher David Stillman has studied an RSL site in the huge Martian canyon Valles Marineris that he suggests is being recharged by an aquifer. The total amount of water liberated from that area equals eight to 17 Olympic-size swimming pools, and the only way to annually recharge such a large volume of water is via an aquifer, said Stillman, who's based at the Southwest Research Institute in Boulder, Colorado. The astrobiological potential of RSL sites has some scientists stressing caution, contending that the areas should be treated as "special regions" for planetary protection purposes in any Mars exploration plan. Recurring slope lineae (RSL) seep in Garni crater on the floor of Mars' Melas Chasm. The Committee on Space Research (COSPAR) defines special regions on Mars as areas "within which terrestrial organisms are likely to replicate" and states that "any region which is interpreted to have a high potential for the existence of extant Martian life forms is also defined as a special region." John Rummel, a senior scientist at the SETI (Search for Extraterrestrial Intelligence) Institute in Mountain View, California, thinks humanity should exercise caution in studying RSL sites. "One of the central goals for Mars exploration is to determine whether or not Mars is the abode of life … or was in the past. Another is to understand the surface of Mars to ensure that it is, or can be, safe for human exploration," Rummel, a former NASA planetary protection officer and COSPAR panel chair, told Space.com. "Both of these goals would be harmed, perhaps permanently, by the introduction of Earth organisms into environments on Mars where they could grow and reproduce," he added. The RSL features are indicative, "at the very least," Rummel said, of processes on Mars that involve fluid flows that nobody understands. And it may very well be that the fluid is liquid water, he added. "To blunder into RSL without cleaning up your rover first, prior to launch, would be a tragic mistake, and a foolish one," Rummel said. "The fact that RSL are on steep slopes where one could very well lose the rover to an unplanned tumble only compounds the problem." Before we study RSL "in depth," Rummel said, "we need to be prepared for the unknown, and clean enough to sink into them if they turn out to be soft spots on the slopes of Mars." How to protect RSL sites adequately is a complicated issue. For example, some scientists at the landing-site meeting asked a difficult question: How close is too close, as far as RSL and special regions are concerned? Could the Mars 2020 rover park on a hillside near an RSL site and study the features from afar? 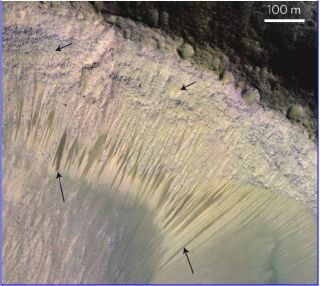 Features called recurring slope lineae (RSL), which could indicate seasonal flows of salty water, are found on some Martian slopes in warmer months. Red arrows point out an RSL in this image taken by the High Resolution Imaging Science Experiment (HiRISE) camera system on NASA’s Mars Reconnaissance Orbiter. "NASA needs to define a policy about landing-site candidates near confirmed or candidate RSL sites," James Wray, an assistant professor at the Georgia Institute of Technology, said at the gathering. During last month’s meeting, Doug Bernard, Mars 2020 Project system engineer at NASA's Jet Propulsion Laboratory in Pasadena, California, said planetary protection for the rover project "is a very rich topic." Bernard said that the Mars 2020 rover will not land in a formally defined naturally occurring special region, or any region where ice has been observed or is credibly predicted within 16 feet (5 meters) of the surface. Also, once down on the Martian surface, the future rover cannot drive to a region of interest within a special region. Scientists continue to investigate the RSL phenomenon, for many questions remain. For example: Is the origin of RSL water atmospheric? If so, RSL sites may show where it is easiest to extract water from the atmosphere. Or does RSL water come from the subsurface? If this is the case, then habitability at these sites would be more favorable, Wray said in his presentation, which was co-authored by Alfred McEwen of the University of Arizona, principal investigator of MRO's High Resolution Imaging Science Experiment (HiRISE) camera system; Colin Dundas of the U.S. Geological Survey’s Astrogeology Science center in Flagstaff, Arizona; and Matt Chojnacki, an associate staff scientist for HiRISE at the University of Arizona. "We don’t think that we’re seeing actual liquid water … we’re not seeing the gun going off, but I would call this maybe the smoke from the gun," Wray said. Having the Mars 2020 rover land near an RSL site would be "most excellent" for Mars science and future exploration, he said. HiRISE is at the forefront of the ongoing RSL studies. The camera helps chart the features, with snapshots of closely monitored sites typically taken every few weeks. More data from HiRISE could help unravel the RSL mystery, Stillman said. "It is essential to determine where these features are," he said. "Once we know where, then hopefully we can answer why." Stillman said that, along with HiRISE imagery, "we are trying to use computers to interpret where the RSL are so we can compute all sorts of statistics on them to really understand when and why they flow." Such modeling work is difficult because salt concentrations change during the flow, and the brine freezes each day, he added. Stillman and other researchers would love to put even more resources toward studying RSL sites. A dedicated Mars orbiter that focuses on RSL would be desirable, Stillman said, as would landed assets that sit and watch RSL flows while making thermal and water vapor measurements. Wray also voiced a desire for the up-close investigation of RSL features. "It would be great if we could observe these things throughout the days of their prime activity," he said. "RSL appear to grow very rapidly right after they form … for months afterward the growth is much slower than the initial burst," Wray added. "But if we could just drive near enough to obtain remote-sensing observations, we could get really unique observations that we will never get from orbit." Wray said that it’s advisable to think ahead to future human exploration of Mars. "RSL could be the best markers of available water near the equator that we have. Think positive, not only negative, about RSL." Leonard David has been reporting on the space industry for more than five decades. He is former director of research for the National Commission on Space and is co-author of Buzz Aldrin's 2013 book "Mission to Mars – My Vision for Space Exploration" published by National Geographic with a new updated paperback version released in May 2015. Follow us @Spacedotcom, Facebook or Google+. Originally published on Space.com.